Here is a quick post to share a piece of python code that I use in nearly every C4D scene these days. It is really simple and all it does is take the current state of the objects “Visible in Editor” parameter and apply it to the same objects “Visible in Render” parameter. The reason I use this is simply because you have a visual indicator in the Object Manager of the current state of an objects visibility, you don’t get this with the Display Tag unfortunately. Would be kinda cool if the eyeball closed to indicate visibility, similar to PS layer switches. 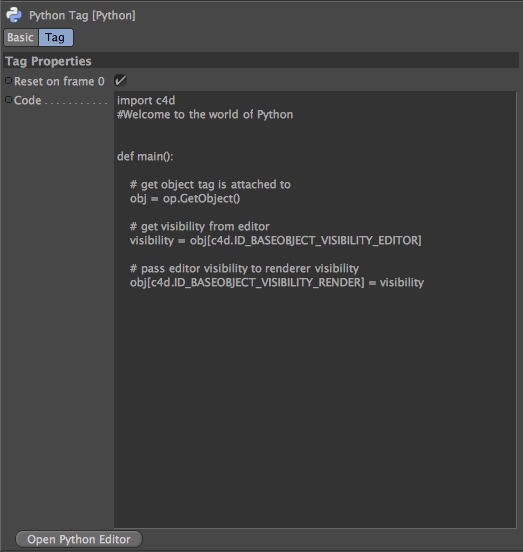 Anyway here’s the code, simply copy and paste this into a Python Tag and then choose File > Save Tag Preset in the Object Manager. The tag will be there for you every time you need it. Thanks to Patrick Goski who actually wrote this little snippet of code. By the way if you get errors when you copy and paste this, it may be because of the formatting, so make sure you don’t use tabs and that it looks like this..
Are you going to NAB this year? Not sure if I’ll be there or not right now..
Why not just alt + click (mac) on the stop watches? @dahh because this tag allows you to only keyframe one dot, alt click changes them both but you would still need to key both dots (if you wanted to see in the editor what was going to render). @AJ Looks cool, thanks for sharing. This is actually awesome! When you’ve gotta keyframe more than a couple of objects on and off, its so tedious without this. @Rich I just tried it and it works ok for me in R14. Python is really fussy about line spaces, so perhaps you typed it incorrectly.